Icelandic whaling company Hvalur said Tuesday it would resume its controversial hunt of endangered fin whales after a two-year suspension, sparking angry protests from animal rights activists. The only company in Iceland that hunts fin whales, Hvalur packed away its harpoons in 2016 because of commercial difficulties in Japan, its biggest market, where consumption has been in decline. Tokyo also introduced restrictive import regulations, notably new standards to measure levels of chemical pollutant PCB in whale meat. "We are going to resume commercial whaling because the Japanese bureaucracy seems to have loosened up and the Japanese authorities have listened to us," Hvalur chief executive Kristjan Loftsson told AFP. 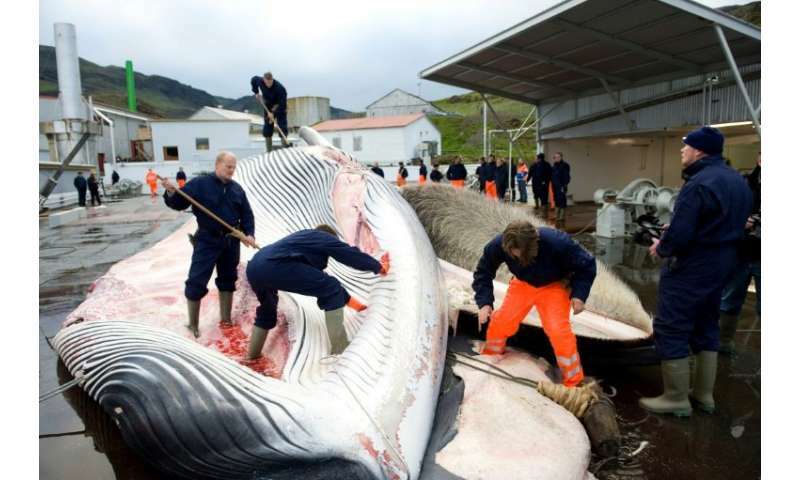 In addition, Hvalur said it plans to collaborate with researchers from the University of Iceland to develop medicinal products made of whale meat aimed at combatting iron deficiency—a condition that affects almost 30 percent of the global population, or two billion people, according to the World Health Organisation (WHO). Iceland's whaling season opens on June 10. Whalers this year have a quota of 161 fin whales, compared to 150 in 2017. In addition, Hvalur is entitled to use 20 percent of its unused quota from last year, which means it will be allowed to hunt 30 additional fin whales. In 2015, during the last hunt, Hvalur killed a record 155 fin whales. "I'm very disappointed," said Sigursteinn Masson at the Icelandic branch of the International Fund for Animal Welfare (IFAW). "This decision is not based on real market needs and is not in line with public opinion polls on whaling, which doesn't belong in modern times." A poll published in October 2017 by the IFAW indicated that 35.4 percent of Icelanders supported the fin whale hunt, compared to 42 percent in 2016. The volcanic island has only one other whaling company, IP-Utgerd Ltd, which specialises in hunting Minke whales, a much smaller species. Iceland and Norway are the only nations that openly defy the International Whaling Commission's 1986 moratorium on hunting whales. Iceland resumed whaling in 2006. The practice has drawn fire from numerous corners including the European Union and the United States which in 2014 threatened Iceland with economic sanctions. Japan has used a legal loophole that allows it to continue hunting the animals in order to gather scientific data—but it has never made a secret of the fact that the whale meat from these hunts often ends up on dining tables. The International Union for Conservation of Nature declared the fin whale—the planet's second largest animal after the blue whale—an endangered species in 1996. Current fin whale stocks in the North Atlantic are difficult to estimate, with the most recent tallies dating back to the early 2000s when their number was put at approximately 53,000.